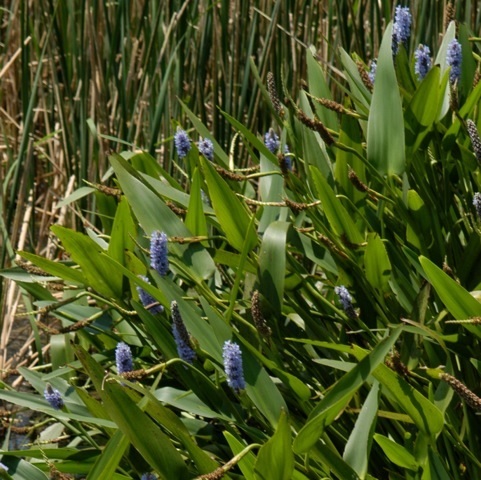 Pickerel weed is a perennial plant that can grow up to 4 feet tall. Leaves are shiny green, heart-to-lance shaped, up to 7 inches long, singly attached to a long fleshy petioles which grow in rosettes from the roots. Stems produce terminal violet-blue flower spikes 3 to 4 inches long. Flowers lasts only one day. Pickerelweed reproduces from seeds and rhizomes. Submerged portions of aquatic plants provide habitats for many micro and macro invertebrates. These invertebrates in turn are used as food by fish and other wildlife species such as amphibians, reptiles, ducks and other birds. After aquatic plants die, their decomposition by bacteria and fungi provides food, called “detritus”, for many aquatic invertebrates. This aquatic plant is an excellent choice for attracting dragonflies, damselflies and other beneficial insects.